Printed electronics is an additive manufacturing technology which is highly efficient, and allows for high volume, cost effective manufacturing for many products which are relied upon every day. Thanks to the development of the printed electronics industry and the new interest in 3D manufacturing and the Internet of Things, there are leading edge printed electronic applications being used in fields such as medical and healthcare, automotive and electronics, learning, aerospace and more. Almax-RP manufactures products using many different kinds of ink technologies. The following list is an overview of key printed electronic inks that are used in this industry. Silver is the most electrically and thermally conductive of all metals. Screen-printable silver inks offer great flexibility and crease resistance for membrane touch keypads and many other applications. Non-electrically conductive, screen printable dielectric ink is used for plastic film, PET film, and both paper and rigid substrates. 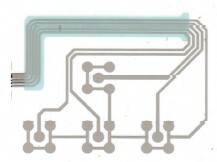 Applications include membrane circuits, computer keyboards, copper-etched circuitry and hybrid circuits. Used with PET film, plastic film and paper substrates, membrane touch switches and rigid printed circuit boards. Indium tin oxide is one of the most widely used transparent conducting oxides because of its electrical conductivity and optical transparency. It can be easily deposited as a thin film. 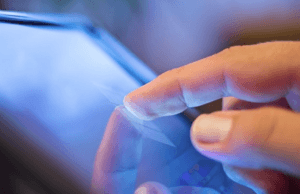 A capacitive touchscreen sensor is made from an array of indium tin oxide (ITO) conductors on a layer or layers of glass or polyethylene terephthalate (PET) plastic. As with all transparent conducting films, a compromise must be made between conductivity and transparency, since increasing the thickness and increasing the concentration of charge carriers will increase the material’s conductivity, but decrease its transparency. Printable transparent conductive inks that provide an adaptable and cost-effective alternative to ITO for some kinds of display devices. These inks are used in conjunction with a protective top layer ink and work great for industrial touch screens, membrane switches, automotive touch screens, backlight switches and printed LED lighting. 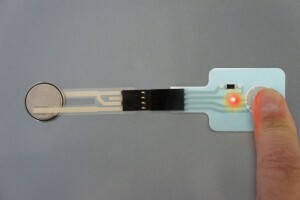 Force sensing resistors have developed from membrane switch technology. Similar user interface design methods and similar manufacturing techniques are used in both technologies. The force sensor is an analog, multi-position switch. A membrane switch, by contrast, has only ON/OFF. Pressure sensitive coating can be used for different kinds of substrates. The more pressure is applied to the sensor surface the lower the resistance and the greater the conductance. This ink shows strong variation of the electrical resistance upon mechanical deformation, allowing the implementation of deformation and force sensors on rigid and flexible or stretchable substrates. This ink generates a voltage variation with applied pressure and also applied a force under electrical excitation. The Ink can be applied for sensor and actuator applications. This ink has the ability to generate an electrical response to the variation of a magnetic field. Several types of sensor and actuators can be fabricated with this ink, including magnetic field and electrical current sensors. Biosensors are analytical devices which convert a biological response into an electrical signal. 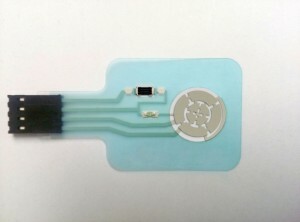 Glucose test strips, EKG/ECG electrodes, pads for muscle stimulation, pads for drug delivery and other medical electronics applications use printed electronic inks to provide accuracy, reliability and compatibility. 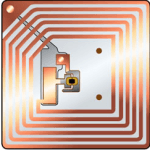 RFID Technology is found in devices like passports, credit cards, transportation payment systems and more. Silver, Carbon, and Dielectric inks are all used for RFID products because they can transmit and receive specific radio frequencies.